A class peeks into our ten-door cooler. The Co-op was pleased to host field trips from Chico Country Day School recently. Over three consecutive days, we led classes of curious kindergartners through our store, from where our fresh produce is delivered and stored, through the grocery backstock, and onto the store floor. The almond-butter machine's crushing and grinding was a source of delight, and the candy aisle, as you might imagine, made all the students very excited (while eliciting eye-rolls from the parent chaperones in attendance). Joey summing up the visit with the kids. After the guided tour, the students broke off into small groups for a photographic scavenger hunt. 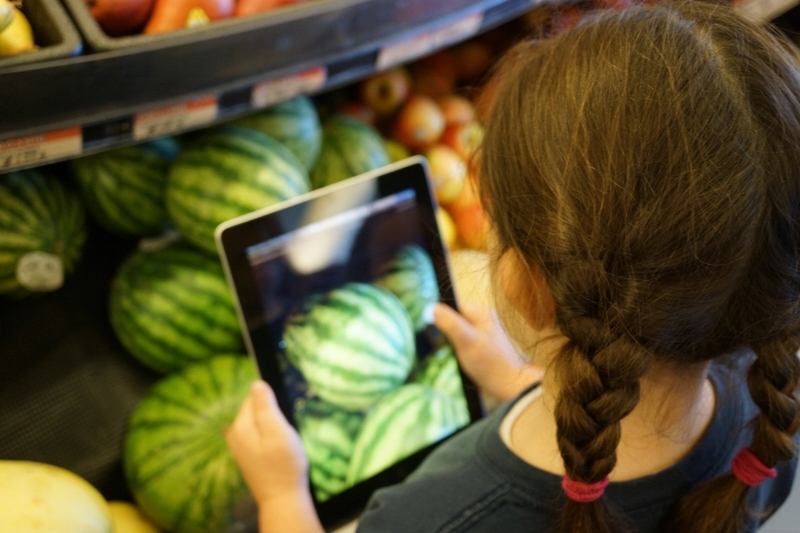 Armed with tablets, they searched the shelves for all the food groups they had been learning about in class. A student snapping a watermelon shot for the scavenger hunt. The trip ended with a healthy snack from the Co-op's bulk department. Freshly fed, the eager young students embarked on the four block walk back to school. We had a great time with our visitors, and look forward to next year's crop of kindergartners visiting!